The Fugi Silicone Profiler, is the best tool for working with wet silicone sealant. 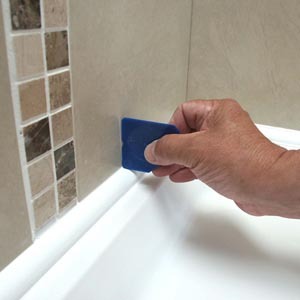 When you are using silicone sealant in the bathroom, it can be a bit of a nightmare but the Fugi tool makes it easy. From our fabulous Cramer Fugi to the Magical clean anything Wonder Wipes we have the answers. We even have a fantastic Silicone Removal Toolmaking the job of removing old mouldy silicone a breeze. Any questions ? Just call us on 01527 522 522 and we will be happy to advise you.